This is a great fridge emptier of a dish. I had a bunch of odds and ends left over the other day and not a lot of time to go the supermarket and came up with this delicious dish. Tasty and quick to make, this is a great midweek meal. Add some oil to a very hot pan, once it starts to smoke, add the onion and mushroom and cook for 1 minute until browned. Turn down the heat and add the smoked paprika and carrots and cook for 2 minutes. Mix the veg stock with the curry paste and add to the pan. Bring to the boil and simmer, then add the butter beans, kale and tomatoes, cook for 10 minutes. Serve with some fresh crusty bread. You can use any greens you like, such as spinach, mustard greens or cabbage etc. The dish would work well with served with baby potatoes, or even some rice or rice noodles. The soup has a light, smokey consistency with a kick at the end, if you prefer a richer or creamer taste you could add some coconut milk. I normally set some goals around this time of year, namely to eat healthy and to try and add more vegetables to my mealtimes. This recipe is fantastic, it is light but spicy and filling and by using tomato juice you are adding more vegetable goodness and a nice flavour. Bring the tomato juice to the boil. Cook the sausages according to instruction. I baked them with a little salt and oil. 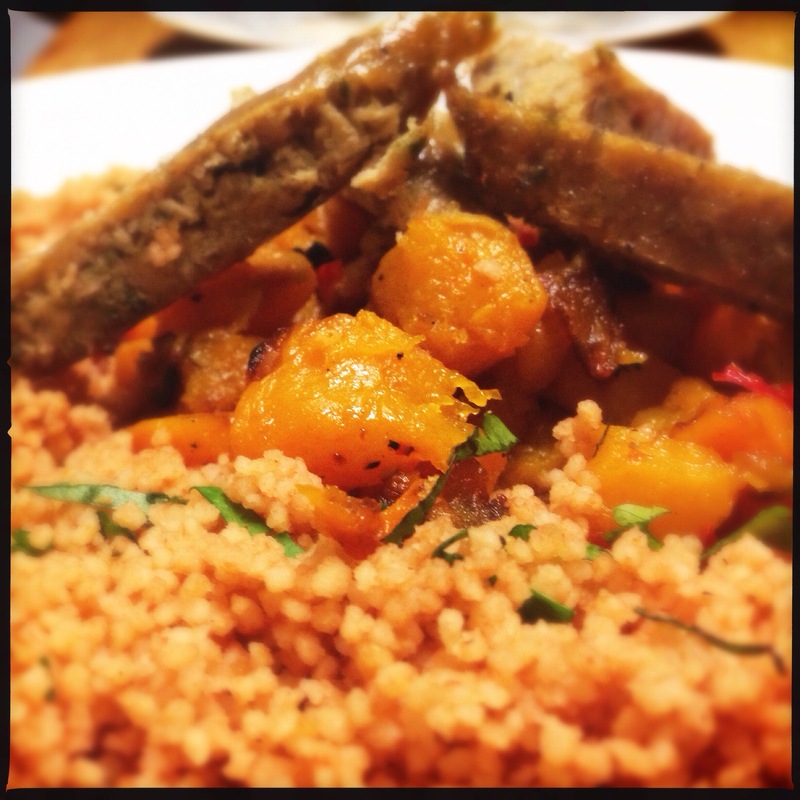 When everything is ready place Cous cous on a plate, the roasted squash in the middle and the sliced sausage on top and enjoy. I added some hot sauce at this stage it tied it together so well. You could also add a dressing to the Cous Cous if you wish. By blending all the herbs with some oil and garlic and salt and a little vinegar of your choice . This recipe makes a lot of Cous Cous but it freezes well and is great for lunch with some salad the next day. You could also half the Cous cous recipe if you want to make less. This recipe is a favourite from my college days. Every Wednesday I would go to my favourite healthy food stall for lunch. They made the most amazing bean casserole topped with basmati rice, yoghurt, bananas and fresh coriander. This recipe is my version of this great dish. Heat a big pot with oil. Add onion and mushrooms, some salt and pepper, and cook on high till browned. Add garlic, ginger, celery, carrots and spices (curry, cumin, coriander, turmeric). Cook for about 3-5 min on medium heat. Add stock. Add beans, tomatoes and chilli. Bring to the boil and simmer for 20-25 minutes. Add fresh coriander. Let it sit to cool for 5 minutes, then serve with rice or any grain you like. This is best made in advance and let it sit for a day to improve the flavor. I love to add more cumin and lots and lots of garlic. And I like mine with bit of a kick – add the seeds from the chilli. Be careful with chilli, and always wash your hands after handing them. 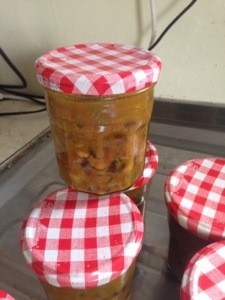 · Wash the lids and jars then boil 4-7 min to sterilize them. · Add the hot casserole to the jars, leave about ½ an inch for the top, wipe the jar with a towel if you spilled any on the jar. Put the lid on tightly. · Put the oven on high. Cook for 4-5 min. · Take out and let cool. As the casserole cools, it will create a vacuum and seal the jar. Jars will then be air tight . They can be store as you would other sauces and jams. Use within 3-6 months. There any may different ways of canning. YouTube is a endless resource of information and has greatvideos.